Envelopes allow you to adjust the exact flow of your parameters. 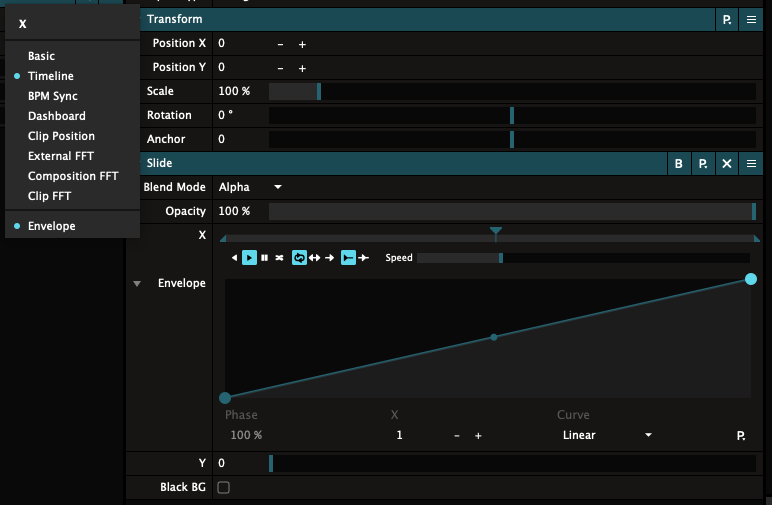 Instead of a regular linear curve, Resolume can adjust your parameter to have a nice ease in and ease out, a bounce behaviour, or even multiple keyframes! To enable an envelope, simply right click a parameter and select Envelope from the dropdown. To get some direct visual feedback, let's go with a Slide effect and apply the envelope on its X parameter. But you can use any other parameter you want instead. Resolume is freedom. By default, a linear envelope is applied. This means you don't see any result, as parameters are linear themselves. Let's change that by applying some easing. Right click on the second keyframe of the envelope, and choose Quadratic In/Out from the drop down. When you now click and drag the X parameter, you will see the quadratic curve is being applied. While dragging the parameter from left to right, the actual X position of the clip will slowly increase in the beginning, then pick up speed halfway through, and slow down again towards the end. Such smooth. Much ease. Very wow. The actual value of the parameter is represented by a smaller vertical line, right next to the usual bigger vertical line. You can think of the big one as the input, and the smaller one as the output, after the envelope is applied. Of course, you can set the parameter to Timeline or BPM Sync animation. The envelope will be continuously applied and you get a nicely eased curve. Tip! 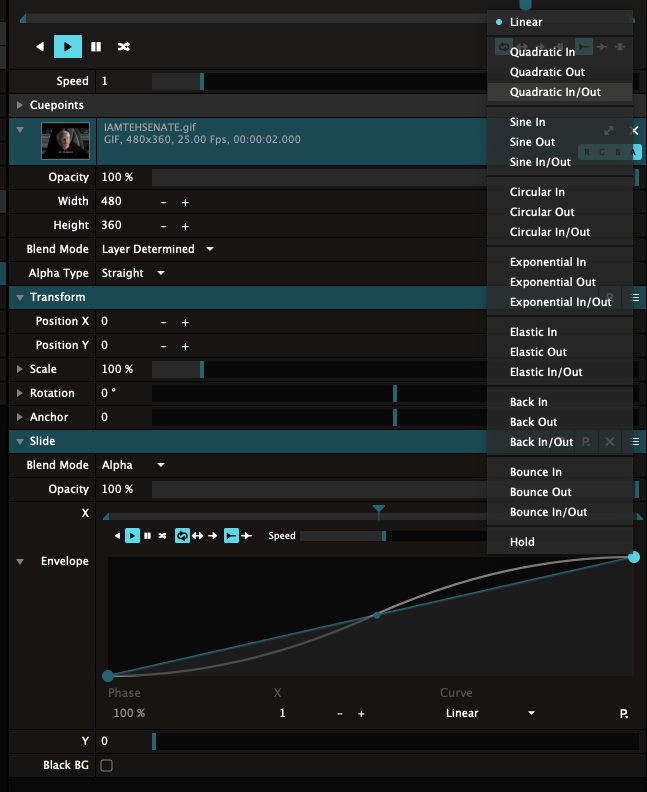 Resolume will apply the envelope to the input of your parameter. This means any input! So it will modify a parameter set to Timeline or BPM Sync, but also FFT and mouse input even parameters controlled via MIDI or OSC. Interpolation is a fancy word for how the line between the keyframes look. You can choose from a variety of interpolation curves. Quadratic, Sine, Circular and Exponential do basic easing at various strengths. Elastic, Back and Bounce let you do some of the harder to master principles of animation without breaking a sweat. Hold simply holds the value of the previous keyframe until the current one is reached. Curves are always applied between the keyframe you've selected and the previous one. An In curve will apply the curve at the start of the interpolation. An Out curve will apply it towards the end. And In/Out will apply it equally on both sides. To add a keyframe, double click the curve where you want to add it. Of course you can still adjust it both vertically and horizontally. To remove a keyframe, double click it. To adjust a keyframe, simply click and drag it around. This will update the value the parameter is outputting in realtime. If your middle name is pixel perfect, you can also use the arrow keys to nudge the keyframe into the sweet spot. The shift modifier also works for bigger increments. And you can even shift-click to select more than one keyframe! If you like your numbers to be perfect, you can also enter the values for each keyframe manually. The keyframe's phase is where the keyframe sits on the x-axis of the envelope. The other value is the output of the envelope. It's named the same as the parameter, and it's basically the value of the keyframe along the y-axis of the envelope. "But Resolume, why do I have to deal with such a weird concept as 'phase'. This isn't Star Trek. Can't I just fill out the time of my keyframe in seconds or frames like I can in After Effects?" That would be awesome, but in Resolume, parameters can be animated in many different ways so time is not always expressed in seconds. Parameters can be animated in beats, or even to the FFT of an audio input. At that point, having time expressed in seconds becomes pretty much meaningless. Also, changing the speed of a regular parameter animation would change at which point in seconds your keyframe will occur. So, to prevent all sorts of weird rifts in space/time, the x-axis is expressed in phase. Envelopes have their own presets. So you can draw the perfect envelope, save it and apply it on every parameter, for all the effects and sources. Awesome sauce. To save a preset, hit the little P at the bottom right of the envelope. You get a pop-up that shows you your previously saved presets and some presets we provided for you. You can add your own by pressing Save.